We offer a range of fixed height and height adjustable laptop tables for office and home, as well as providing an option for airport lounges, libraries, public waiting areas and other working environments. Laptop Tables can be a very useful additional to any open office environment, functioning as a small side table, coffee table, occasional table or informal desk. No more balancing your laptop on your knees, our modern laptop tables will ensure that your expensive equipment is kept secure and level, and with adjustable versions, at exactly the right ergonomic height for working. Perfect for agile working environments, modern laptop tables come in very handy for use in conjunction with high back office sofas, stools and reception furniture, providing a useful surface. Some of our height adjustable laptop tables are designed to be used with a chaise longue or designer bed, so you can work in complete comfort, whilst others such as Risefit Adjustable Table can easily be moved into position with castor wheels providing manoeuvrability. 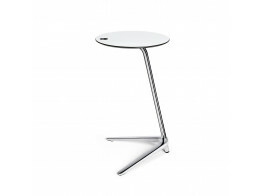 Occasional tables such as Sweetspot Tables and Add Table are designed for brief ad-hoc smartworking; for checking emails or notes before a meeting. 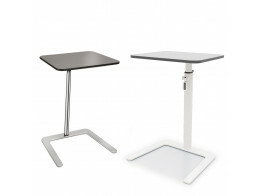 Our advanced height adjustable laptop tables function well as small single user desks for smart working, such as Brainstorm Training Tables, Talon Tables and Computer Side Table LS 05. Versatile, our modern office laptop tables can be used as lecterns for tablets, laptops or paperwork, as well as in industries such as construction and beauty, alongside our range of leaning stools, promoting active seating and sit-stand working. 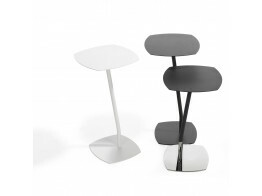 Contemporary laptop tables from Après Furniture. 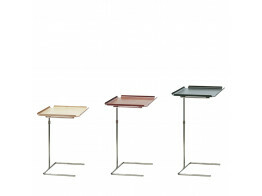 Tray Table is a height adjustable side table or laptop table, ideal for use in lounge settings. Flamingo laptop tabes perfect for touch down working and breakout spaces. Space Chicken Height Adjustable Laptop Tables for use in soft seating areas. 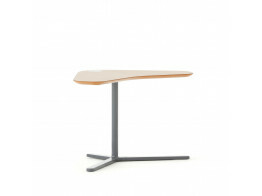 Talon Tables is a family of versatile table solutions providing laptop space for agile working spaces. 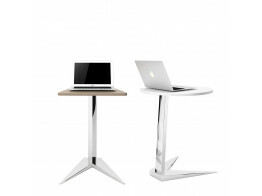 Agile working Nova Laptop Tables are modern elegant chrome steel construction ballasted base tables. 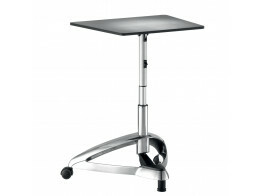 Risefit Adjustable Table is a mobile laptop table ideal for smart working in soft seating areas. 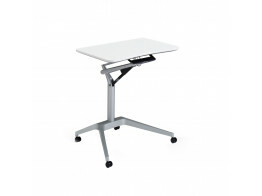 Dolphin Laptop Table is a height adjustable table which can be used as a modern lectern. Add Laptop Table is a mobile workstation; coffee table for quick meetings or hotel lobby desk point.